(c) Kaustav Bhattacharya 2008 - All rights reserved. A dramatic scene as Tibetan supporters hold up flags and shout and scream "Free Tibet" at the top of their voices. Photos can provoke such powerful opinions. 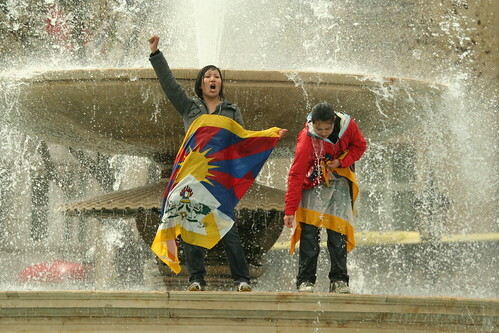 I'd just like to say that I'm neither in support of or against the whole "free Tibet" argument. I think it's sad that the Olympic Games are being hijacked by political agendas. At the end of the day I'm just a photographer and I like to cover current affairs events in the city I live in. I went to this event and as I was walking around I noticed these people and thought it would make a great photo, however it's in no way reflective of my opinion on the Tibet issue but I hope you do like the photo! Listen to my audio recording from the London Olympic torch rally.